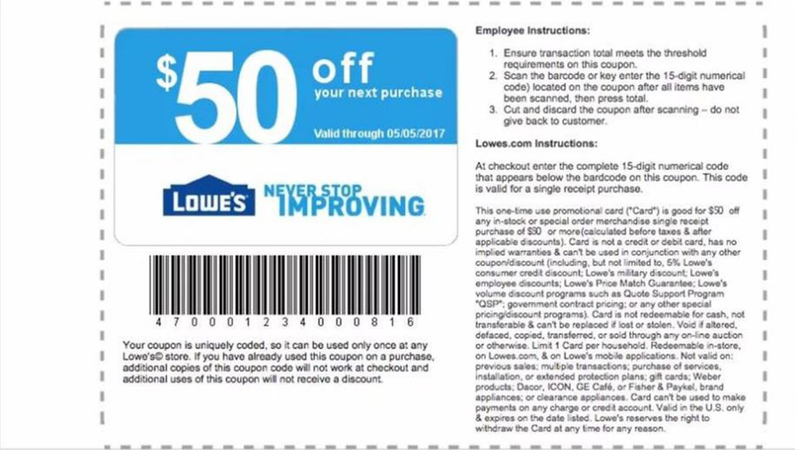 It's another Facebook scam that people are falling for... A free $50 off coupon at Lowe's. But this isn't the first time the scam has made the rounds on social media. WSET reports the scam started back in 2015, with the link to a fraudulent website adorned with the Lowe's logo. The newest scam is presented as a promotion for a Mother's Day coupon offering customer's $50 off their next purchase. The "coupon" appears as a shared link on your Facebook account and once you click the post to claim your coupon, you are taken to the fake Lowe's website. However, this page is a fake survey designed to steal your information. Customers on Facebook are asking Lowe's if the coupon is legit, and Lowe's has confirmed that the offer is definitely a scam, WNEP reports. "Please be careful when responding to any pop-up ad either online or via social media; as, more often than not, the offer of gift cards or other prizes to customer's in the guise of a specific company are set up to get your personal information for nefarious purposes," the company said in a statement.